The Ivanti power management tool allows you to monitor power usage on your managed computers from a central location. You can easily create and deploy power management policies and generate reports to evaluate financial and power savings. You control the conditions under which computers and monitors stand by, hibernate, or power down. Power management includes a feature that lets users avoid specific power management actions (such as a hard shut down) using a client-side user interface. The avoided action will take place the next time the policy runs or is updated on that computer. The Ivanti agent that is deployed to every managed device includes a power management option. 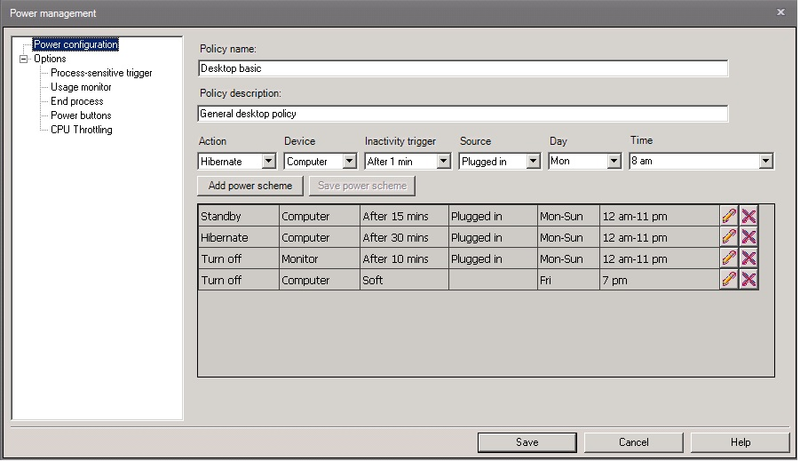 When you choose to deploy a power management policy to a device, it is enabled as part of the agent. You define policies based on the specific needs of different types of managed devices. You can then deploy the policies to groups of devices in your organization. For example, you would define one policy for servers that need to be running continuously and a different policy for desktops that are typically not in use overnight and on weekends. If a user is working on a computer when the policy would normally shut it off, a client interface notifies the user, who can delay the shutdown as needed. The power management tool includes a set of tool buttons that allow you to complete various power management tasks. Delete: Deletes the selected power management policy. Refresh: Refreshes the items displayed in the left pane. Schedule: Click to schedule the deployment of the selected power management policy. Reporting: Click to run a report that estimates the power and cost savings you can get by deploying the selected power management policy to a specified group of devices. You can also run a report that shows the power and cost savings across a specified time interval. Historical data: Click to collect client usage information for more accurate estimation of power usage. Customize: Lets you customize the settings that define overall power usage for specific manufacturers and computer models. Application management: Lets you manage processes that may be running when a power policy is applied.